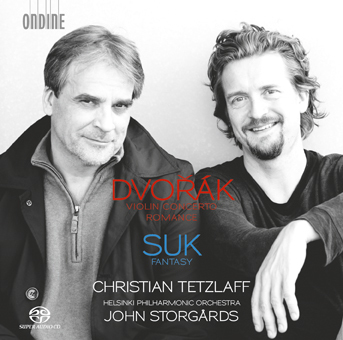 Ondine is proud the present this exciting program by the award-winning violinist Christian Tetzlaff. This new recording includes works for violin and orchestra by two Czech composers closely connected to each other, Antonín Dvořak and Josef Suk. Tetzlaff is accompanied by the Helsinki Philharmonic Orchestra conducted by John Storgårds. Christian Tetzlaff has been considered one of the world’s leading international violinists for many years, and still maintains a most extensive performing schedule. Musical America named him “Instrumentalist of the Year” in 2005 and his recording of the violin concertos by Mendelssohn and Schumann, released on Ondine in 2011 (ODE 1195-2), received the “Preis der deutschen Schallplattenkritik”. Gramophone Magazine was choosing the recording of the Schumann Violin Sonatas with Lars Vogt (ODE 1205-2) as ‘Disc of the Month’ in January 2014. In addition, in 2015 ICMA awarded Christian Tetzlaff as the ‘Artist of the Year’. His most recent recording on Ondine with Brahms’ Trios (ODE 1271-2D) received a GRAMMY nomination. Dvořak’s Violin Concerto is a work which the composer worked and reworked probably more than any other composition. This technically demanding work for the soloist was originally dedicated to Joseph Joachim who, however, never played it in public. Nevertheless, after its publication by Simrock in April 1883 its fame spread like wildfire and it was adopted into the repertoire of countless leading violinists, to widespread acclaim from public and critics alike. Dvořak’s Romance, Op. 11 is a delightful work written few years before the concerto and arranged for violin and orchestra by the composer. Josef Suk, Dvořak’s pupil and later his son-in-law, was a remarkable violinist. It is surprising that the wonderful Fantasy, Op. 24 written in 1902 – a neglected gem in the violin repertoire – is his only concertante work for the violin. This work requires a wide spectrum of violin technique such as double-stopping, playing on open strings, and virtuoso runs, which demand a delicate grasp of voice and sequence.